Allison Coil is starting life over in the Flat Top Mountains of western Colorado, leaving behind a high-powered career in an ad agency to guide hunters through the wilderness. The reason for her complete turnaround is disclosed in flashbacks to a deadly airplane crash she barely survived. The experience left her with physical and emotional scars, and she is hoping to find peace and safety far from city crowds and planes that fall from the sky. In the early months of her new job, she finds neither. George Grumley, the owner of the most successful hunting guide business in the area, turns her down flat. She's had no experience beyond her management skills and her ability to handle horses, and no one in this male-centric business is willing to give her a chance. She finally gets hired by Pete Weaver, a kind man, well-respected in the community, who agrees to give her a chance. She's a quick study, and soon she can set up camp, track an elk for the hunters, and help them field dress their kills in no time flat. Most of the hunters who come to the Flat Tops want to use skill and experience to find their prey, and they want to feel that they have earned their trophy heads and the meat the animals provide. Some, however, would like things to be made easy for them, and there are companies who are willing to accommodate them, tagging and tracking choice prizes in "canned hunts." Grumley runs one of these companies, and he is extremely careful about keeping this secret. When an inexperienced but exuberant hunter from one of his groups mistakes a protestor for an elk, Grumley convinces him to cover up the man's death, hiding the body, getting rid of his rifle, and keeping his mouth shut. Unfortunately for their plan, Allison catches a glimpse of a man pulling something through the heavy snow. When the protestors discover one of their own is missing and demand that the authorities mount a search for him, Allison tells the sheriff and her boyfriend David Slater, a U.S. Forest Service resource conservation officer (aka: Forest Ranger) what she saw, and where she saw it. Other odd things happen that get her attention. One of Grumley's guides, Rocky, a man who had been helpful to Allison when she first arrived, has gone missing, and she fears he may also be a crime victim. His boss and others who know Rocky tell her he's just gone off on his own, as he often does, and he'll turn up when he's ready. She refuses to believe that and sets off to find him on her own. Also, she finds a beautiful elk bull dead on the ground with no visible wounds, and she wants to find out how he died. When she returns to the site with boyfriend David Slater, she discovers a collar with a GPS tracking device around the elk's neck. Similar devices are used by biologists, but she can't find anyone doing research in the area. Grumley's deception is further threatened when the clueless hunter who shot the protestor refuses to follow his directions. Instead of keeping a low profile, he joins the protestors, claiming he has seen the error of his ways and wants to help stop the killing. This garners major media attention for the protestors and pushes Grumley to the edge of panic. He first tries to eliminate all potential threats, including Allison and his own wife, and when that fails he goes to Plan B. He discovers that Allison is not easily stopped, and that his wife is made of sterner stuff than he realized. 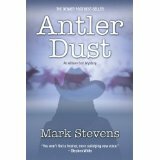 ANTLER DUST, the first in the Allison Coil series, is an excellent debut for Mark Stevens. The writing is flawless. Stevens even-handedly handles the issues of hunting from both the pro and con viewpoints. As for antler dust, it is definitely in the "con" category, an example of the lengths some people will go to make a buck — or a lot of bucks. The setting is vividly described, letting the reader experience both the beauty and the danger of the wilderness in winter. Allison has her flaws, but she demonstrates the resilience of the human spirit. If you would like to read an interview with author Mark Stevens, please click here. If you would like to read a review of BURIED BY THE ROAN, the second book in the Allison Coil series, please click here. Copyright © 2011 Over My Dead Body! All rights reserved. Reproduction in whole or in part in any form or medium without express written permission of Over My Dead Body! is prohibited. OMDB! and OMDB! logos are trademarks of Over My Dead Body!